Howdy all, as you know we've been slaving away in the stoods lately recording our upcoming ep. The first track to be released to the world is Audrey. It's a song about a girl.. She likes to fool around. 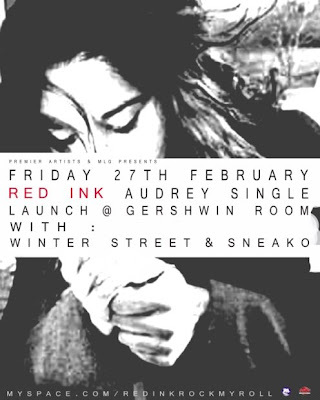 She likes to dance and she likes to get her way.. We're officially launching it on February 27th at the Gershwin room.. The poster is attached.. spread the word people, it's time to paint the town red.